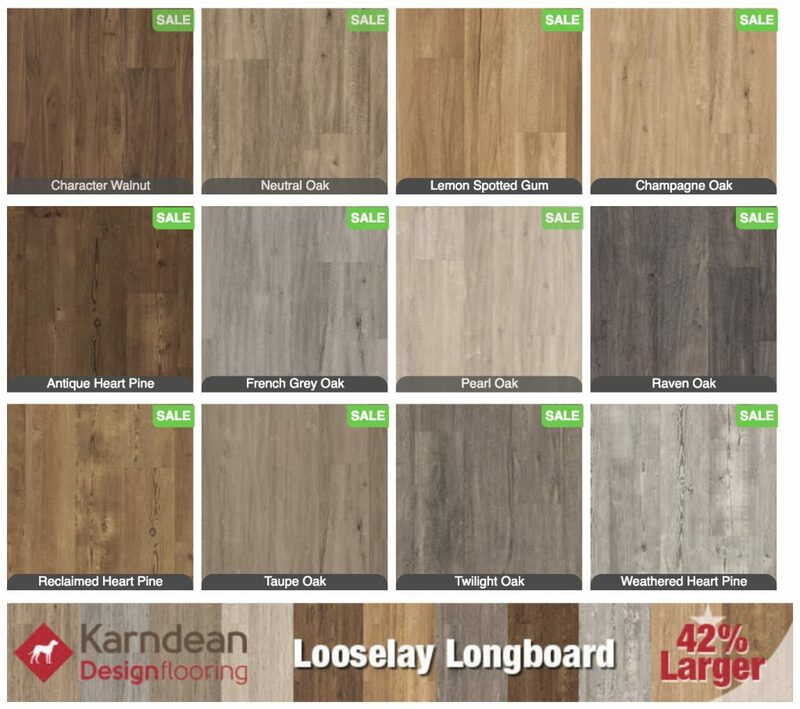 Karndean Looselay Longboard Plank on Sale at ACWG | Floors, Flooring, Carpet and More! Karndean Looselay Longboard plank was created to give customers who want to show impact in larger rooms or venues but need a quicker installation time. American Carpet Wholesalers or Georgia has this great plank floor on sale! The Karndean Looselay Longboard plank collection will increase the length of the planks by nearly 18 inches! The width is still a very generous 9.84″ but the length will go up to 59″. In a large room or space this will make an unmistakeable impression and look very chic. The Karndean Looselay Longboard plank has a lifetime guarantee backing it up. Even without that all you would need to do to fix a plank would be to simply pull up the damaged plank and drop in a new one! LooseLay Longboard features 12 modern wood designs. Each is faithful to the authentic European, American and Australian woods including pine, walnut and spotted gum. Also, just like the original Karndean Looselay flooring the Longboard will be warmer underfoot than natural hardwood. As an added bonus Karndean Looselay Longboard plank is made to be easy to use with underfloor heating. Plus, these planks are WATERPROOF! As for installation, Karndean Looselay Longboard plank can be installed on a subfloor that is solid, smooth and dust free. Basically it can be fit and installed over pretty much any existing hard surface or floor. Karndean Looselay Longboard is a durable flooring choice, backed by a lifetime guarantee. Karndean Looselay Longboard will not splinter, warp or crack like is possible with real hardwood flooring. American Carpet Wholesalers or Georgia has a wide selection of Karndean Looselay Longboard, on sale now in its Dalton, GA showroom and in its online catalog. Be sure to check out the collections online and then give their flooring experts a call to discuss your flooring choice.